Do you feel like throwing in the towel, but want to be a great leader? Would you like to build an organization? Do you want your child to be the best she can be? 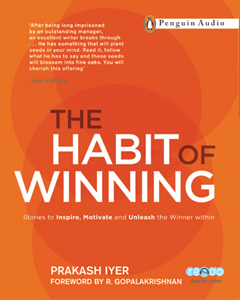 If you answered yes to any of these questions, The Habit of Winning is the book for you. It is a book that will change the way you think, work and live, with stories about self-belief and perseverance, leadership and teamwork - stories that will ignite a new passion and a renewed sense of purpose in your mind. The stories in The Habit of Winning range from cola wars to cricketing heroes, from Michelle Obama's management techniques to Mahatma Gandhi's generosity. There are life lessons from frogs and rabbits, sharks and butterflies, kites and balloons. Together they create a heady mix that will make the winner inside you emerge and grow.